This structure is perpendicular to the red wall, built on the right-hand side (north) of the trophy of Gaius during the second half of the 3rd century. 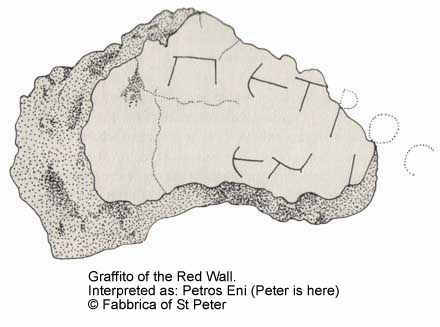 The wall gets its name from the surprising amount of Latin graffiti carved into the plaster by the faithful who visited the tomb of St Peter between the end of the 3rd and the beginning of the 4th centuries. The graffiti includes names, petitions, Christian symbols of complex interpretation and signs superimposed on one another on the reduced surface of the wall. 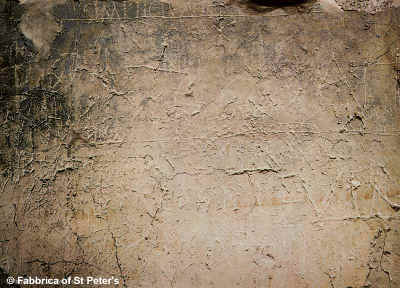 In abbreviated form, St Peter's name is present on the wall at least twenty times, usually accompanied by prayers for the dead person named - in one case expressing joy that the lost relative lay in the same cemetery that held Peter's own body. 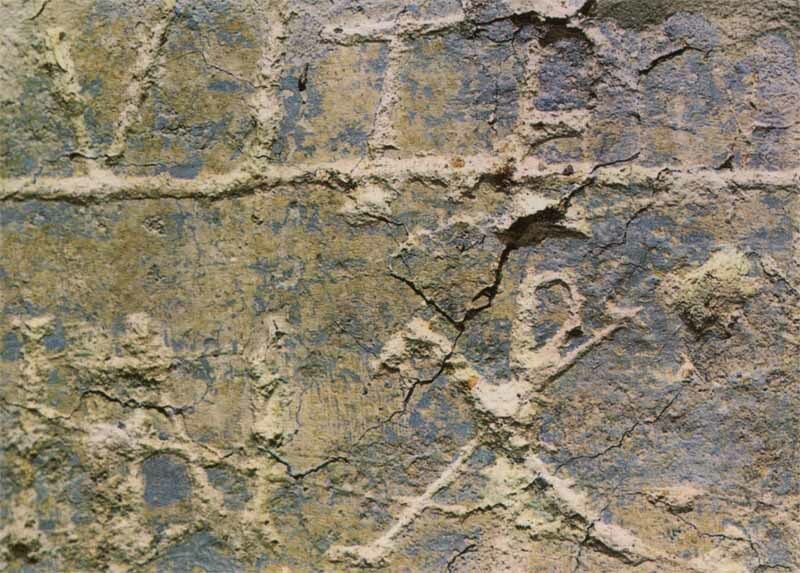 On every part of the wall - freestanding between the letters of a name, formed from or engrafted onto existing lines - there occurred the initials PE or PET. At the beginning of the 4th century, a burial niche, internally covered in marble slabs, was built into the depth of wall G. During the excavations of 1941, bones were found inside the niche of Wall G. Initially these were not though to be the bones of St Peter, and they were simply stored away in the Grottoes for many years. 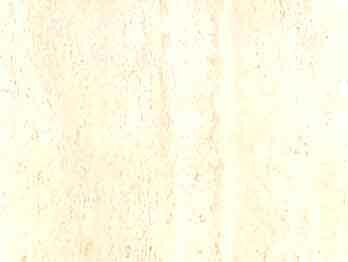 Later, Margherita Guarducci, who was researching the graffiti of Wall G, had the bones examined. Professor Venerando Correnti, of Palermo University, one of Europe's most distinguished anthropologists, made a full-scale anatomical study of the bones now widely believed to be those of the apostle. 1. The Constantinian monument was considered, in Constantine's day, to be the tomb of the martyr. 2. Inside the monument-sepulchre there exists a loculus, and one only: the loculus of Wall G.
4. The loculus was never broken into from the age of Constantine until the time of the excavations (about 1941). 5. From this loculus come the bones which were removed at the beginning of the excavations, kept without interruption in a nearby spot in the Vatican Grottoes and recovered from this spot in 1953. 6. 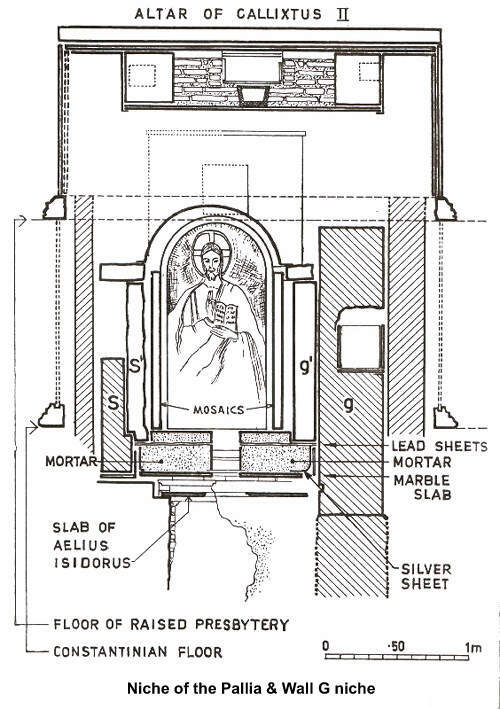 These bones, therefore, are the ones which were verified at the time of Constantine as the bones of Peter and place in the loculus of Wall G, inside the monument-sepulchre. 7. The cloth of purple interwoven with gold-thread in which the bones were wrapped at that time confirms the highest dignity then attributed to the remains. The royal purple harmonizes perfectly in fact with the royal porphyry which decorates the outside of the monument. 8. The anthropological examination of the bones - belonging to a single individual - showed that they conform perfectly to what, by tradition, we can imagine was Peter's physical appearance at the time of his martyrdom. Apart from the obvious fact that they belong to a male, the bones indicate a sturdy build and an age somewhere between 60 and 70. 9. The earth encrusted on the bones indicates that the bones themselves originally lay in an earth-grave, and we know that Peter's first burial was in the earth. 10. The characteristics of the earth, shown by the scientific examination, match those of the place where the original tomb was dug (marly sand), while in other parts of the Vatican area the earth is different (blue clay or yellow sand). 11. The place of the earth-burial under the Trophy was found empty. This is in harmony with the presence of the bones, transferred about two metres higher up, in the loculus in the monument of Constantine.